All Azimut yachts for sale worldwide are listed below, scroll down to view them. Azimut has been the number one shipbuilder of choice for the construction of megayachts for 12 years running. The brand, in conjunction with sister company Benetti, stands for innovation, advanced technologies and the style excellence of Italian manufacturing. Azimut Yachts produce luxury yachts that also stand for value. Their yachts are built at cutting-edge boatyards, where the Azimut-Benetti Group’s research and development program translates into high-tech yachts and superyachts. 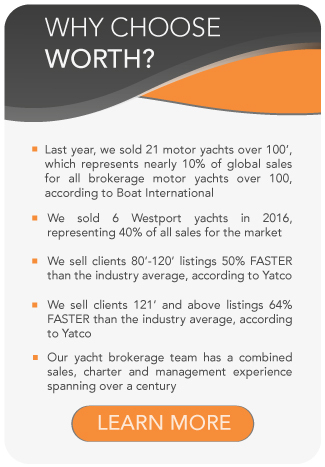 With 130 sites worldwide, Azimut Yachts boast the most extensive yacht sales and service network in the world, with representative offices, boatyards, service points and delivery centres located in Europe, the Americas and Asia. Yacht owners buying an Azimut yacht for sale will benefit from their dedication to standards of luxury and service. ‘Ford T’ of the boating world) and the Azimut 105’ Failaka in 1982, the biggest mass-produced fibreglass yacht of its time. Azimut-Benetti Group now in place, Azimut was now able construct its own yachts, defining new style and industry standards that would go on to revolutionise the boat building industry, such as large frameless windows and walnut interiors. If you are interested in buying an Azimut Yacht, contact the team at Worth Avenue Yachts. With Azimut’s vast network of dealers and service points, an owner of an Azimut Yacht can be assured of exemplary service right from concept through the lifetime of the yacht. This modern industrial boatyard covers 50,000 m2 and is the site of Azimut’s executive offices. With cutting-edge technologies for production efficiency and the utmost environmental compatibility, the boatyard is specialised in the construction of quality fibreglass yachts under 72 feet. Azimut’s site dedicated to yachts over 75 feet long is much more than a boatyard; it’s a luxury workshop. Designed by the famous architects Gabetti and Isola, this state of the art facility brings together expert workers and skilled craftsmen and an innovative styling lounge dedicated to boat owners who want to oversee the construction of their own yacht and select the features. Azimut Yacht’s delivery centre at Savona Port serves as a service, outfitting and delivery point. The state-of-the-art site features controlled temperature and humidity conditions, plus the superb area at Varazze Marina. With a new boatyard of 200,000 square meters, yacht owners in Brazil can now enjoy Azimut yachts directly constructed at an Azimut boatyard under modern and efficient production processes. A service and after-sales centre for the United States, Canada and Central America. Azimut Yachts has been in China since 2008, and through its representative office in Shanghai, has developed a sales network with 5 dealers in the most important cities on the coast: Dalian, Qingdao, Shanghai, Xiamen and Shenzhen. Azimut Yachts places the most comprehensive range of services available at the disposal of its yacht owners, including financial services, additional warranty, courtesy yacht services and a premium concierge club. Contact us today to explore our available Azimut yachts for sale, or to discuss a Azimut new-build.